Once upon a time there were four little rabbits, some gatecrashing, a tense dude named McGregor, and a pervasive lack of pants. But Will Gluck’s Peter Rabbit is a bit of a departure from Beatrix Potter’s twee kids’ books. And you might think, ugh, not another attempt to lengthen and embellish a piece of classic literature beyond all reason (looking at you, Peter Jackson). But hold on. This (cotton) tale takes place somewhat after the events in Ms. Potter’s books. Both Peter’s (James Corden) parents are dead and there’s a new McGregor in town, Domhnall Gleeson (perhaps most familiarly known now as the strident General Hux from the Star Wars saga). Gleeson’s McGregor is an acutely type A city slicker who longs to immediately sell his recently inherited country estate in order to reinvest the profits in a business venture back in London. Until he meets the animal lover/bunny portraitist Bea (Rose Byrne) who lives in the Pinterest-worthy cottage next door. This gets Peter’s invisible knickers in a twist for two reasons: 1) restricted access to the tantalizing McGregor garden, and 2) a rival for the affections of Bea who, in the absence of his own rodent parents, has become personage he invests with a significant amount of maternal affection. The conflicts escalate in cartoon violence that’s kinda Home Alone by way of the Odd Couple. 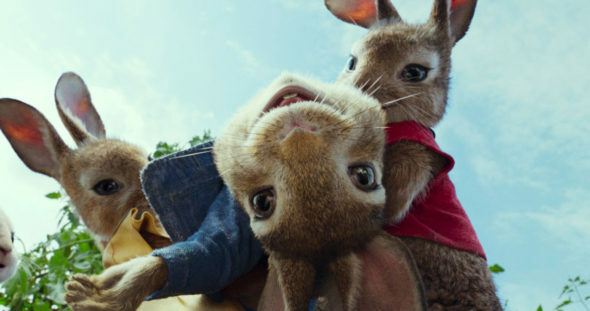 And, as you might expect, it is an absolute delight to see Gleeson rant in nearly Shakespearean cadences about the antics of an anthropomorphized rabbit. Like Gleeson, the supporting cast is also a delight. Margot Robbie, Elizabeth Debicki, and Daisy Ridley stand out as Peter’s siblings Flopsy, Mopsy, and the devil-may-care Cotton-tail. If you want to get all highbrow about it, the entire movie can be read as a metaphor for a kid’s struggle to accept a new romance in the life of a primary caregiver. And if you want to be honest, it bears as much resemblance to its source material as my 4-year-old’s picture of me does to the Mona Lisa. But there’s enough beautiful animation, fun 90s and early 00s songs, and Easter-egg jokes for parents in case the kids decide they really like this movie and you have to watch it 400 times. ← You Can’t Punish in Here. This is the Red Room of Pain!